ProCamera HD, the gold standard for professional iOS photography, provides a highly intuitive interface for beginners as well as DSLR-like controls for experts. 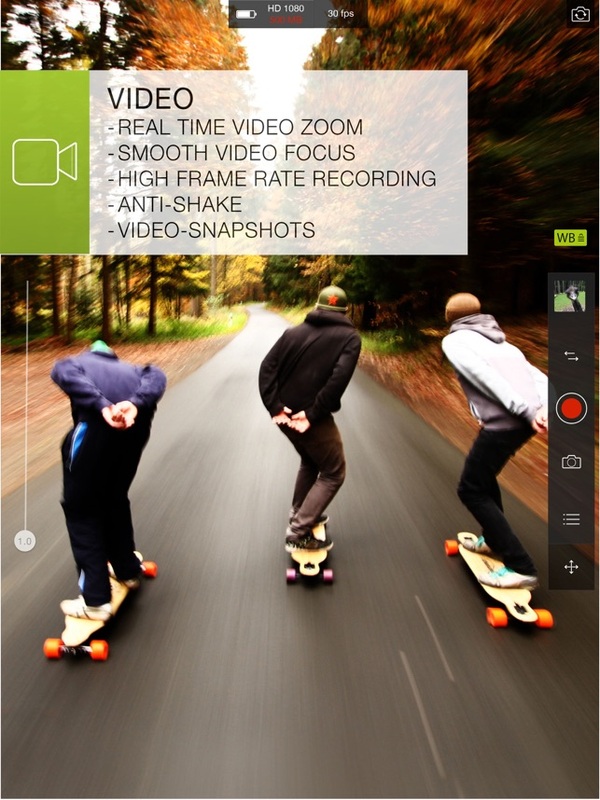 Leveraging the capabilities of the iPad, ProCamera HD is easy to use, yet deep when needed! The NY Times says "the high-end crowd swears by it". National Geographic chose ProCamera as 1 of 8 "must-have travel apps". 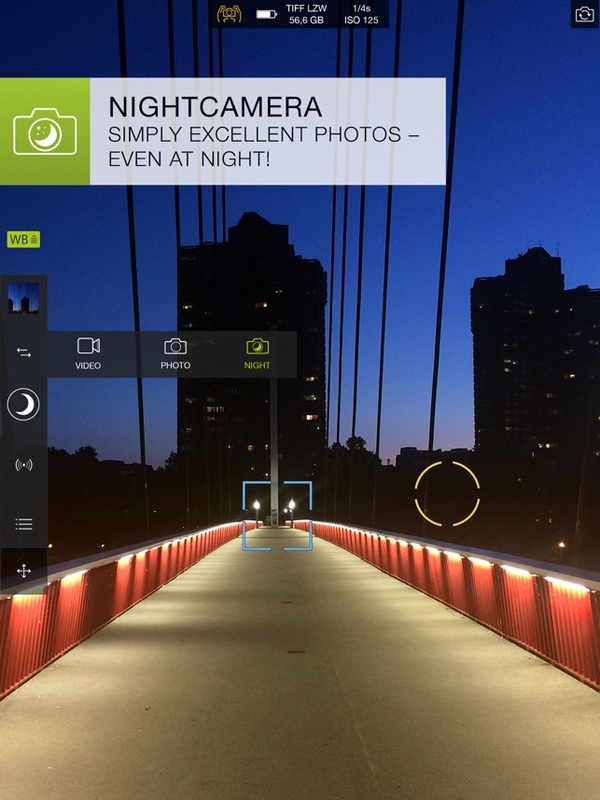 Forbes hails ProCamera as an app that "provides nearly any camera feature you could need". 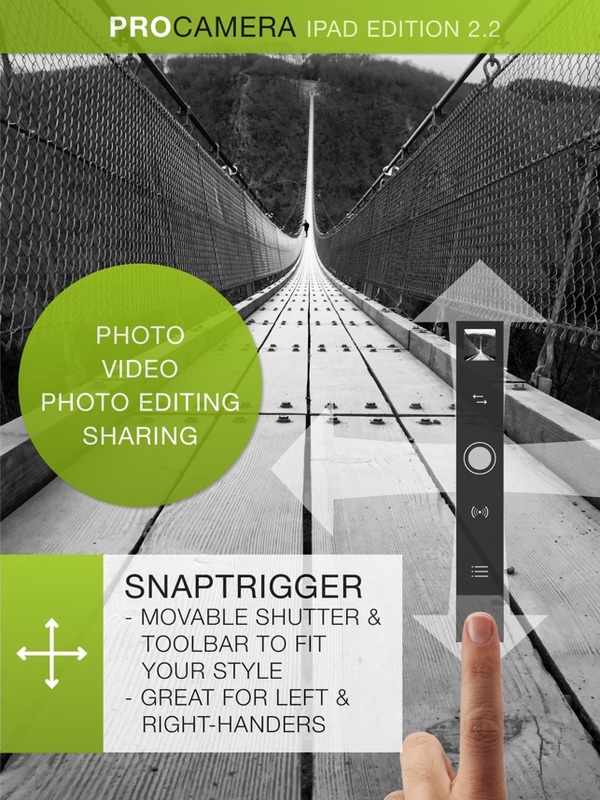 With our Snap Trigger, you can choose where you want your shutter button and camera controls to be. Separate Focus and Exposure points plus White Balance Lock allow for fast and creative control in both photo and video mode. Our frame rates range from cinematic 24 fps to thrilling 240 fps for stunning slow-motion videos. You can take photos in video mode - even while recording. Record in UHD (4K) resolution on the iPad Pro 9.7". Broad range of capture formats (4:3, 3:2, 16:9, 1:1, 3:1, Golden Ratio) use maximum screen real estate for precise composition. In this low light mode, you can set slower shutter speeds up to 1 second (depending on device) for better photos in dim light. For perfectly sharp photos and steady videos. For perfectly straight photos and videos. For saving, sharing, exporting, or deleting photos or videos within the app. Seamlessly swipe between aesthetically pleasing out-of-the-box filters and adjust their intensity. 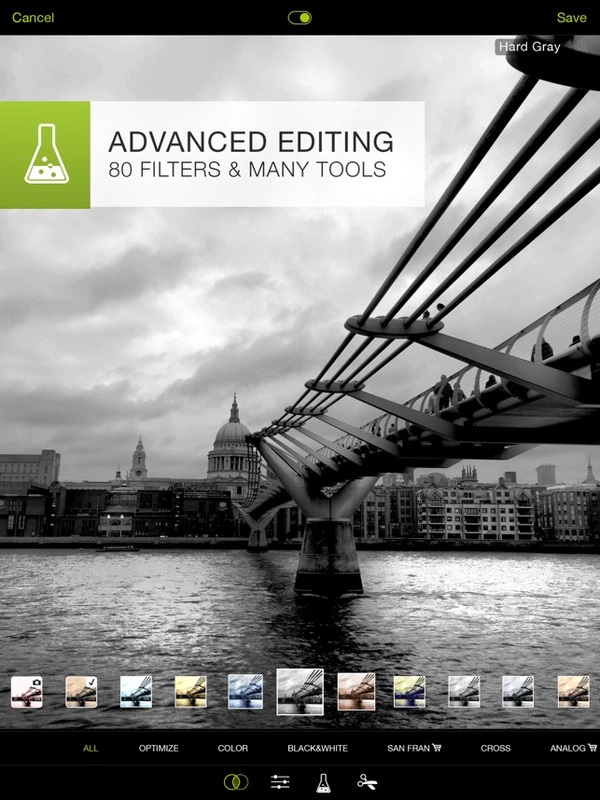 You also get a large set of professional editing tools to refine, adjust and crop your photos. 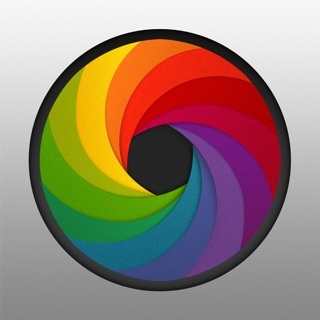 ProCamera HD offers a seamless integration with iOS photos. It provides a photo viewer that lets you zoom into sub-pixel level to inspect your masterpieces in great detail. Thumbnails in your photo albums are shown in their NATIVE ASPECT ratio. Optionally REMOVE GEO-TAGS and RESIZE PHOTOS/VIDEOS before sharing to social media or sending them via iMessage, Mail etc. TIFF, RAPID FIRE MODE, SELF TIMER, FAST LAUNCH SPEED, FULL SCREEN TRIGGER, SKIN TONE FRONT FLASH, HISTOGRAM, DIGITAL ZOOM, SLOWMOTION video player, MANUAL, EXIF/VideoMetaData Viewer, PHOTO COMPASS, and much more. ProCamera HD, together with the dedicated iPhone version ProCamera, covers all your mobile photography needs. Join the ProCamera community. Visit our blog for tutorials and to get up to speed on the latest iphone photography news. Tag photos with #procamera in Instagram for a chance to be featured. Contact us via ‘customer service’ within the app or drop us an email for suggestions. We value your feedback. Major overhaul of our editing studio! Our photo editing studio is ready for the future. It now supports gigantic files as well as Display P3 (Wide Color) from start to finish. Create unique artistic effects using the new editing tools Bloom and Gloom. Experiment with these new additions to the Magic Lab (flask icon) found in our editing studio. Color correct your images or emphasize the mood by making them appear cooler or warmer. 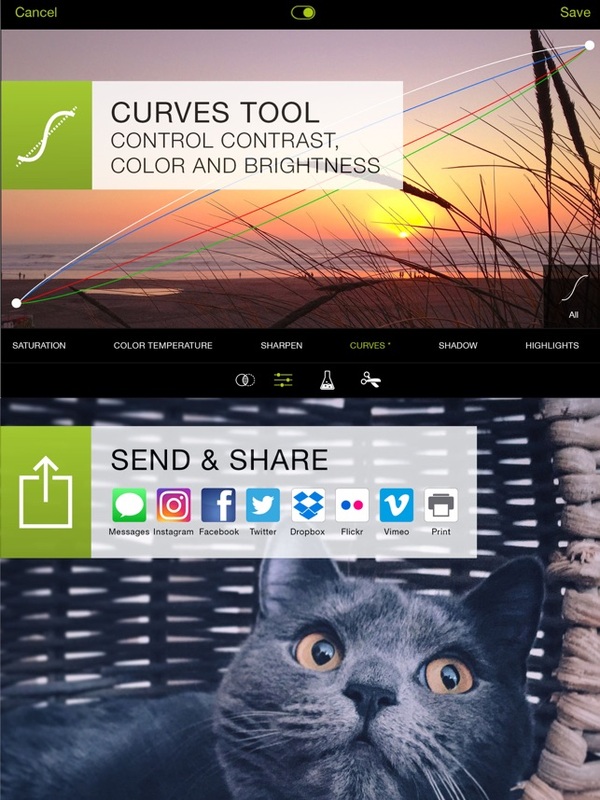 Both color temperature and tint can be adjusted in this intuitive new tool by swiping vertically and horizontally. Enhance your images with a single swipe. Use the new "Adaptive" filter based on intelligent image analysis to automatically improve your photos. The filter will enhance your image just the right amount so that it still maintains its natural appearance. If a tilted horizon is detected in an image, our Straighten tool will automatically rotate the photo for you. You are still able to manually adjust the angle or revert to the original by double-tapping the dial. If you have any suggestions or find a bug, please let us know via in-app support or email us at support@procamera-app.com. Visit blog.procamera-app.com for the latest information about ProCamera. If you enjoy our app, please consider leaving a review in the App Store or updating your previous one. Every single review is much appreciated. Thank you! Update: I submitted this note to the support team and I got feed back. These changes may or may not accrue but at least they got back to me and explained a few things. I really do hope the dev team takes this note into consideration and as I noted before I'm willing to pay again and more if this app includes all these features. Thanks again! I Own the iPad and the iPhone version so I paid for both and I can tell you right now that they are not the same. The iPad version doesn't have the histogram or ISO levels and the iPhone doesn't split selection between focus and exposure. I don't want a refund I just want it to be one noted that they don't include the same features and two that they should be fixed to have the same features. It's the same app is it not? P.S. Keep the split exposure and focus, it works better then the iPhone version. The Histogram and ISO should be displayed on both iPhone and iPad versions. If you guys could add ISO control and Exposure Lock EV lock not fixed on an object/location changing but rather metering with exposure control/lock that would be fantastic. I don't expect shutter speed and aperture. Don't think the iPad/iPhone camera sensors are capable but if they are I would pay up to $15 to for full manual controls Dslr style withe the ios simplicity. I will fix rating after you fix the original problems noted. This is the best camera replacement app ever, and I absolutely love it! It comes with all the functionalities you could think of - from anti-shake and self-timer functions to full control of exposure, focus and white balance. SnapTrigger, which enables you to move the control bar around the screen is a nice little feature, too. This app supports both photos and videos, so you don't need to have separate apps - everything can be done within this one sleek app with no hustle. It's very intuitive to use, and the quality of photos and videos is superb. I highly recommend this app to casual photographers as well as skilled ones. I have been a long time user of the iPhone version of ProCamera, so I was thrilled to find the iPad "HD" version. Sadly I was very disappointed to find that the very cool image editing features in the iPhone version did not make it to the iPad version. Ironically, you have very convenient access to the Camera Roll and all the Albums stored on the iPad, but there is nothng you can do with them except share them, "as-is". Hopefully a future update will add editing tools and features like Pro FX and Pro Lab. These are essential, in my opinion, since the iPad is a very capable editing platform. If you consider the iPad2 with a pretty lame camera, the great camera features of this app are really wasted.